In this stew, layers of carrots, potatoes, onions, and seared beef marry with a variety of herbs and a can of stewed tomatoes. Beef chuck is the best cut to use in a slow-cooked stew. For the very best results, sear the beef in a small amount of olive oil before you add it to the crockpot. If you're short on time, you can skip the step, but the caramelization created by searing adds rich beef flavor. Peel the carrots and slice them into 1-inch rounds. Peel the potatoes and cut them into 1-inch chunks. Peel the onions and chop them coarsely. Cut the beef into 1-inch cubes. Heat the vegetable oil in a skillet over medium-high heat. Add the beef and sear until it is well-browned on all sides. Place half of the sliced carrots, potatoes, and chopped onion in the crock pot; top with the beef cubes. In a small bowl, combine the flour, pepper, thyme, basil, and oregano; sprinkle over beef. Add the remaining vegetables then top with the stewed tomatoes and their juices. Sprinkle with Worcestershire sauce. Cover and cook on low for 8 to 10 hours, or until the meat is very tender. Taste and add salt, as needed. 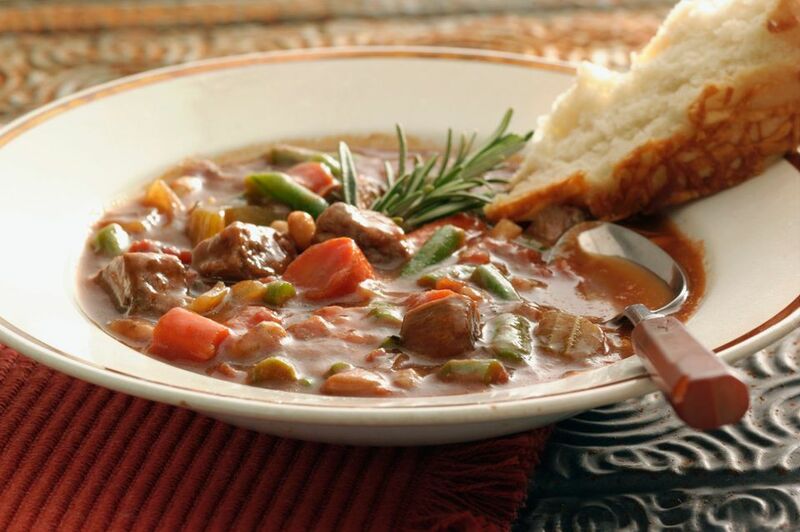 Serve the stew with a crusty no-knead bread or buttermilk biscuits. Low starch or medium starch potatoes are the best options for soups and stews. High starch potatoes, such as russets or Idahos (baking potatoes) tend to break down. Red-skinned potatoes, new potatoes, fingerlings, and long whites or round whites are all good choices. For extra flavor, deglaze the skillet the beef was cooked in with about 1/4 cup of stock, wine, or water. To deglaze, add the liquid to the pan immediately after you remove the beef to the crockpot. Bring the liquid to a boil while stirring constantly and scraping up the browned bits in the pan. Transfer the liquids to the crockpot. Condensation usually adds plenty of liquid to crock pot dishes, but if the stew needs more liquid near the end of the cooking time, add an extra can of tomatoes with their juice or some beef stock. There are many ways to tailor this stew to suit your taste. Add some diced rutabaga or turnip along with the potatoes and carrots. For more color and flavor, add about 1 cup of frozen (thawed) vegetables, such as peas, mixed vegetables, corn, or green beans about 20 minutes before the stew is ready.